With the heat at near record levels, I hadn't been drinking much wine lately. Then I remembered I had a bottle of Two Shepherds Grenache Rosé 2014. It's so pretty, a gorgeous shade of light red, that I almost didn't want to open it. But one taste and I was saying "Where have you been all summer?" Of course, you can drink this wine all year round, but it is so perfect for summer. I know it's almost a cliche to call a rosé "refreshing," but this one really is. It's bright and vibrant and goes so well with the kinds of foods we eat in summer: grilled foods, vegetables, salads. Chinese takeout. 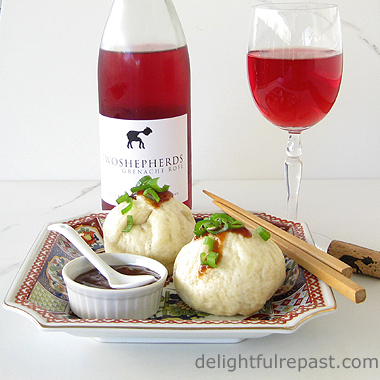 I was feeling ambitious, in spite of the heat, and whipped up a batch of steamed pork buns for lunch. Thought they might be good with the rosé. I was soooo right! I had a little left over and enjoyed it with an avocado sandwich the next day. Yes! An avocado sandwich. And it was a wonderful pairing! Here's my review of Two Shepherds Grenache Blanc. Two Shepherds specializes in "cool climate Rhone wines that express place and vintage." The one-man micro-winery began commercial production in 2010 with just 175 cases and has grown steadily from there. Now they're expanding their operation so they can bring us more of their wonderful wines. They've launched a crowdfunding campaign, and you can see more about it at Indiegogo Two Shepherds story. 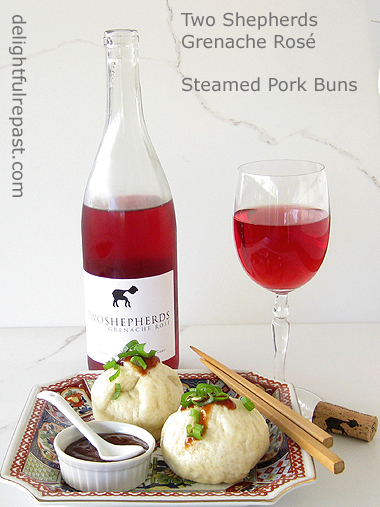 These Steamed Pork Buns (or is it Pork Steamed Buns?) were great, but I did not have time to get the recipe together for you this week. Soon. What is your favorite hot-weather food and wine pairing? Sully, that's okay. I would never encourage anyone who doesn't already drink alcoholic beverages to begin. I enjoy a glass of wine with a meal, but other than that ... I don't like "getting stupid or otherwise dulled." Nice review Jean! I love their wines. Thanks for the reminder as I need to stop by their tasting room and pick up a few bottles, including a rosé! Thanks, Richard! You are so fortunate to be so close to all those wineries! I'm not like Sully, I do drink but only occasionally. Summer is on its way and I'll see if I can find that wine here. It IS pretty! Too funny, Maureen ("I'm not like Sully")! I hope you have a lovely (and pain-free) summer. Such a beautiful color....no idea if it is available, but I understand the rose wines are the "in" wine. Linda, even if this one isn't available in your area, look for a grenache for a similar wine. I had to smile when I read "in" -- imagine that! It's purely coincidence when I'm doing something that's "in"! Thank you, Greg! I always look forward to reading more of Ken's wine posts. Sounds like a lovely wine, Jean! It was interesting to read about Two Shepherds vineyards and their growth too. I love so many different wines and so many different foods, it's hard to pick a favourite wine pairing but I do have a soft spot for Pinot Noir and dark chocolate! Thank you for sharing this delicious review with us at the Hearth and Soul hop. April, thank you! And, yes, Pinot Noir and dark chocolate does pair well -- on those rare occasions when I'm in the mood for chocolate (I'm *always* in the mood for pinot noir!). Hi Jean. I like your wine review. Do you often review wines? Your style is understated and gentle, rather calming. We have had various wine TV programmes in Britain over the years. My favourite wine connoisseur is a lady called Jilly Goulding. She is an extrovert to say the least. I must find one of her reviews and send it to you. She will have you rolling about and not just because you've been drinking wine!!!Ha! Ha! Tony, thank you! Every once in a while I review a wine. I like your description of my style (didn't know I had one!). No, I've not heard of Jilly Goulding. Must check her out. Nice review Jean, Love the color, I will try to find this in my local liquor store. Thanks for introducing a wonderful wine to me. Thanks for sharing with Hearth and soul blog hop, pinning. Thanks, Swathi. You do an amazing job with the Hearth and Soul blog hop! That is a beautiful bottle of wine! I love trying new wines and definitely need to try this one now that the weather is starting to cool down. Ashley, you'd love it, I'm sure! Might even go good with your gorgeous fall salad in a mason jar.